I just wanted to post this here so long to show my progress on a game I'm busy making in UE4. So far I've got basic character movement, a re-sizable grid, volumes that I can put in to change the type of block and control if it should spawn foliage or not, a working inventory system, dynamic weather with global values to change the wetness of everything, a dynamic day/night cycle and a few more little things and changeable blocks. Here is some images of what I've made so far. The visuals look cool so far. Do you have a way to do any farming yet? Is it possible to place things in the ground and let them grow? (It's a little hard to tell from the screenshots exactly what's going on, because there's a lot of placeholders, like a block titled "Item1" doesn't help me imagine how the system works). Is water (and wetness) going to be a major feature of the farming aspect? Also, since there is a day/night cycle, is your character going to have to sleep at night? I'm keen to see more progress! I love farming sims. 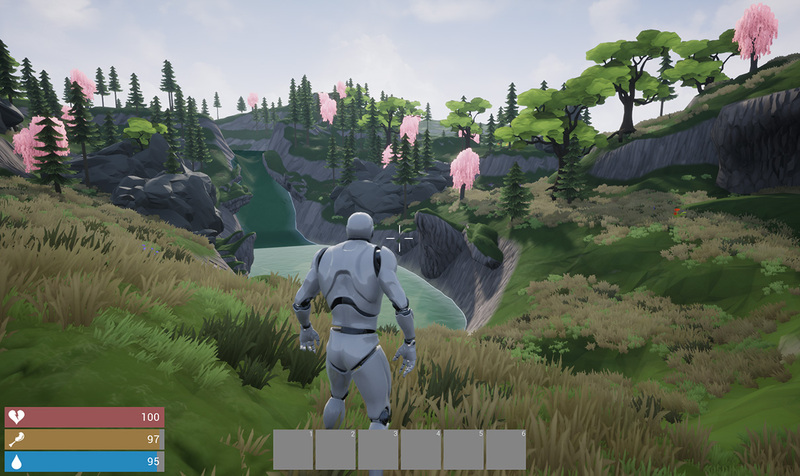 Thanks, so far the foliage assets are from the Infinity Blade assets just so I can prototype faster instead of spending time to make assets. They all will change over time. I do have ways to farm, each foliage asset spawned can be harvested and drops certain items from a preset list which I can easily adjust to add/remove stuff and can be planted/placed down. There's still some bugs to sort out before I can show that more in-depth. Since it is a farming game, water is going to be a major thing, it will reduce the need to water your crops and might even effect other things like you move slower in the rain or who knows what else. Day/Night cycle does mean sleeping at night, so if you stay up too late it will effect you the next day like having less stamina. Most placeholder icons and such will change soon, so luckily it will be more clear about what's what. Side note: I posted here just to keep myself motivated to continue with this project and to force myself to stay active/productive and not to get stuck on a single thing and just to actually make something I like. Just a quick update: I've been working on the inventory, got a currency and and merchant up and running, so there's not much to show there. I've also been working on a visual style which I might go forward with. Also got a substance designer file up and running so I can apply the same style onto any of the meshes I make so everything fits nicely. Decided to scrap the blocks idea, was way too performance heavy. After deciding to use my own marketplace asset pack, I bought a few packs off the UE4 marketplace as most of them already do what I want and have the look I want to go for. (I don't want to reinvent the wheel). I still have a lot to do, add and change.